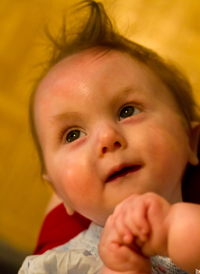 Frank and Lisa's baby Lilly was diagnosed with Trisomy 18. 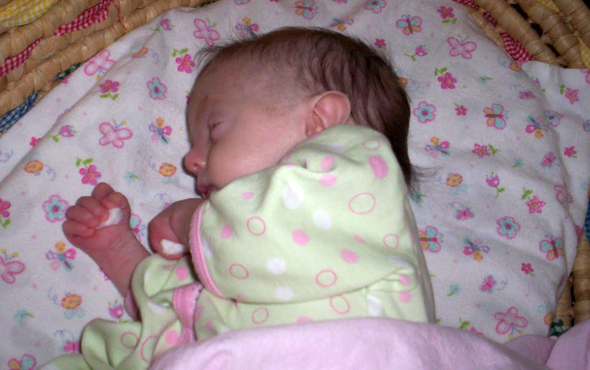 She was born on 4 July 2010 and lived for seventeen months. Little Lilly is gaining weight! Lilly is getting a mix of breast milk and formula. The doctor said to increase the amount of formula powder mixed into the water in her bottle. It must be working because she was up to 4 lbs. 15 oz. this past Monday. Yay! One very important reason for Lilly to get up to a healthy weight is so that she will be a good candidate for open heart surgery. She has a hole in her heart and needs a patch on it. Hence, the reason why our current prayer request for Lilly is that she'll gain weight. When I was pregnant, I had two special ultrasounds done by a pediatric heart doctor. It could be seen that Lilly had a hole between the bottom two chambers of her heart. (Unfortunately in a place that it is very rare to close on its own.) 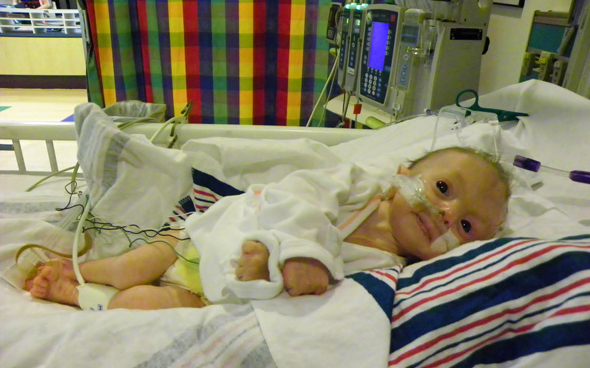 The majority of Trisomy 18 babies apparently have this heart defect. (Called ventricularseptal defect, or VSD.) 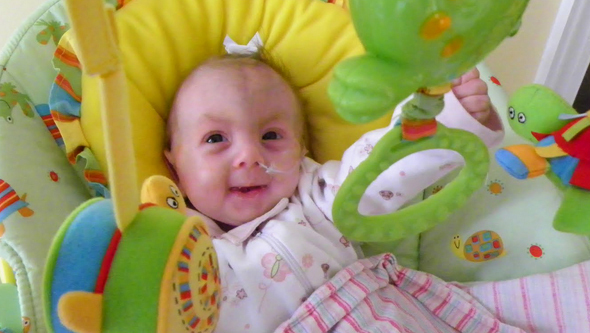 We learned that Lilly would need open heart surgery by the time she was 6 months old to correct the problem. (A patch would be put in over the hole.) If she did not have the surgery, she would eventually suffocate because her lungs would have to work too hard. We learned that the surgery was pretty routine and had a very high success rate. Later I learned that those same doctors have refused to perform the surgery for our wee girl. I find this baffling and frustrating. Yet I was not really surprised as I continually read that parents of T-18 babies often have to fight to get treatment for their children. I talked to the chief of surgeons at the Wolfson Children's Hospital in Jacksonville, Florida and they are going to do heart surgery on Lilly. We are so excited! On 30th September - nearly 3 months after Lilly was born - she had the pulmonary artery band inserted into her heart. She started her day with a bath and then posed for a final pre-surgery picture for mama. Doesn't it look like she's smiling?! Lilly is five months old today! I feel so much joy and relief that I feel like bursting into tears. To make today extra special for her, God sent snow! Great, big wonderful snowflakes. When it started, I grabbed Lilly, wrapped her in her quilt, and put a hat on her and dashed out the door. I've learned that where we live it can start snowing and then stop by the time you get your jacket and gloves on. Unfortunately you can't see the snow in this picture, but it was snowing. It finally started sticking after awhile but there was no accumulation. Happy 1st Birthday, little miss firecracker! Sunday night we celebrated Lilly's birthday eve by driving a few blocks over to watch the town's fireworks. While waiting for them to start, I recounted to Lilly her amazing birth story. She listened politely. Then when the fireworks began, I stayed in the car with Lilly because I thought they might bother her. But then, being unable to resist, my 2-year-olds squeals of delight - we got out and joined the family. The noise didn't bother Lilly at all (a positive to having some hearing loss I guess) and she seemed fascinated by the all the lights in the fireworks. On Lilly's actual birthday we went to visit Pop, my father-in-law, in the hospital. He and mom, my mother-in-law, were happy to celebrate with Lilly. Pop has never been able to speak much since his stroke in February, and sadly now has kidney poisoning and isn't expected to live more than another week or two. (Please pray for comfort for the family, especially his wife.) But when he saw Lilly he gave her a big smile. 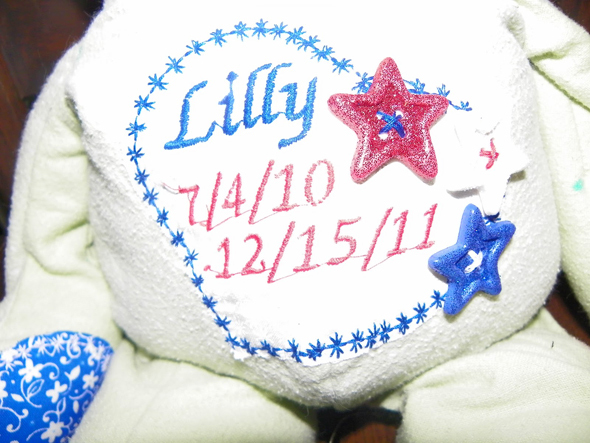 I reminded him that he came to see Lilly on the day she was born and he nodded attentively. I have a nice little stash of red, white, and blue clothes for Lilly now, and she is continuing to celebrate her life by wearing a different one of those outfits each day this week. Hey - we'll probably do it all month long! I really dislike statistics, but I do like one I heard this spring. 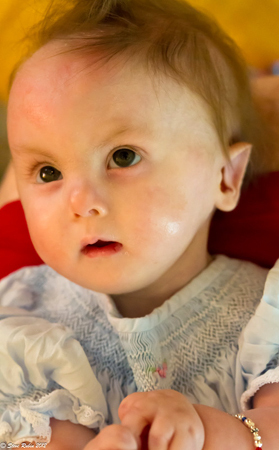 That of the children with Trisomy 18 that make it to one year, 60% make it to five years. What a more encouraging statistic than only 10% making it to one year. We are so grateful to God for allowing Lilly to live! It was a wonderfully happy ordinary day! In fact, the first half was so ordinary that I have suddenly found myself hazy on the details. Lilly woke up and we did her usual morning routine. She was happy and smiling a lot. I got lots of neck sugar from her! Her congestion seemed a bit better, though, she was coughing occasionally a cough that sounded a bit barky. While I was washing Lilly's things in the sink, I had her in her bouncy seat. That was when she was really playing well and I got my camera and shot a short video. I'm so thankful I did! In the early afternoon, Lilly had physical therapy. She did great, working hard, and seemed to be really enjoying practicing sitting. Her therapist even commented, at least once, that it was hard to believe Lilly was sick because she was acting the best she had since we brought her home from open-heart surgery last month. It really seemed that overall Lilly was doing well. I knew she still had some congestion so that something was going on inside. But she was on the antibiotic, and Xopenex, and was just acting so Lilly-like that I thought she was really on the mend. Lilly was usually in my arms, lap, or close to me throughout the day every day. That day was no different and she went for her afternoon nap. We usually let her sleep until about 6:30 p.m. She often woke before that, or around that time. I liked to feed her and we liked her up by then so she'd be sleepy at bedtime. But this evening she didn't. As I usually did, I knelt down by her and started speaking to her as I pulled off her blanket. When I did I suddenly noticed she felt cold. REALLY COLD. Then I saw her face. The coloring was completely wrong. It resembled some of the pictures I had seen in a class I took on death investigation back in college. The paramedics arrived within minutes and grabbed Lilly. We got in and they immediately began trying to revive Lilly. (We didn't go anywhere but stayed in the driveway.) Lilly looked like a rubber doll lying there. I held one of her little hands as they worked. I felt numb with shock. Lilly wasn't responding to anything they tried. They told me that they would keep trying as long as I wanted them too. My husband was finally able to join me. We decided that it was time for them to stop. Lilly wasn't coming back. I really didn't cry so much until the next day. Even then, I think I was still in shock. And we've just been so busy that it hadn't really sunk in. But I am feeling the huge void of Lilly not being here. I have the need to take care of her still. And so I'm feeling lost without doing that. Without getting her neck sugar. Without holding her."